How are all you Paleo Challengers faring so far? I'm hanging in there and, other than needing to be a little more organized about meal planning, it's going well. I've not had any dairy, coffee, alcohol or sweeteners (including stevia). I've been able to keep my fruit intake quite low and my veggie intake is up. I'm not doing any starchy veggies (although I still had a little butternut squash to finish on the first day). There is NO chocolate currently in my house, save for baking cocoa and that's not all that tempting. I'm still trying to cut back on the almond butter and eggs (no eggs today!) and that's been maybe the hardest for me. I did have some minor sugar cravings the first few days, but nothing that a little sauteed apple with spices (cinnamon, allspice and cardamon) couldn't fix. I also discovered that a few thawed organic frozen strawberries mashed into some thick coconut milk with just a pinch of sea salt is a great low carb paleo dessert. One thing I've frequently been eating with meals is Sunja's Mild Kimchi, which is great for digestion and repopulating the healthy bacteria in your digestive tract. It's also super yummy. That brings me to the point of this post: GUT HEALTH. One of my focuses during this challenge is improving my gut health. 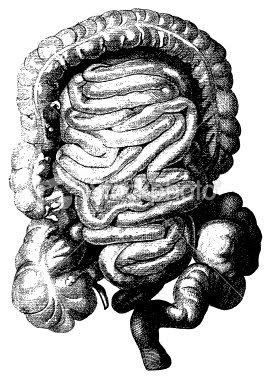 Our gut (small and large intestines) houses a huge part of our immune system in the form of beneficial bacteria. We create certain nutrients there, such as vitamin K (integral to the absorption of calcium into the bone matrix). We need good bacteria for the conversion of thyroid hormones. We also absorb nutrients through the gut lining. But what happens when we absorb things through the gut lining that have no business getting through? Many people have some degree of "Leaky Gut Syndrome", i.e. small intestinal wall permeability and when the protective lining of the gut is compromised, partially digested food molecules and proteins are able to enter the blood stream where they don't belong. Once they're in the blood stream, the immune system goes "WTF??" and decides to attack these "foreign invaders". When it encounters the same molecules over and over again from frequently eaten foods, it might begin tagging them for attack and this results in food intolerances, sensitivities and poor immune function. If it goes on long enough, autoimmune conditions can result. So, what causes leaky gut? Colostrum: a liquid produced by all mammals before the milk production starts, colostrum is what develops the baby's gut lining in the first few days (babies are born with no bacteria in their gut). I've found colostrum to also be a stellar immune builder and safe for those of us with autoimmune issues who have to be careful about other immune building supplements. I use Symbiotics Lactoferrin capsules. Seacure: hydrolyzed whitefish protein capsules that contain gut healing peptides. Seacure has been around for decades and is used by aid workers in third world countries to heal children of malnourishment. Reuteri: Reuteri is a very hardy strain of probiotics that quickly increases the density of intestinal villi. I use Nature's Way Reuteri. Another great gut-healing supplement is the amino acid L-Glutamine. Not only is it great for leaky guts, it's also great to kill sugar/carb/alcohol cravings (I can personally attest to this!) The dose for leaky gut healing is 2 grams (2000 mg.) 3x/day. Regularly eating cultured and fermented foods like kimchi, sauerkraut, cultured veggies, kombucha (the low sugar kind) and cultured dairy (if you tolerate it) is a great way to keep your gut healthy. So, here's to the Paleo Challenge and here's to healthy guts! And Robb would have you hanging next to me for the beans, LOL! I love him! I honestly think that there's a lot of individuality as to what we can eat- i know of too many people who have healed with dairy products, but then I know some that can't tolerate any (true casein intolerance). I suspect that beans are not the worst thing for me but I'd just rather consume my carbs as veggies (I just love squash!) or fruit. Keep me posted on your "Slow Carb" diet (I love Tim, too! You should've seen me doing the "Cat Vomit" earlier today;) I'm totally going to experiment with that kind of calorie cycling down the road. It's hard to say because I was taking many things at the same time, but I've had good luck with colostrum in the past for immune deficiency symptoms. Nora Gedgaudas recommends a specific kind of colostrum to her autoimmune patients. She recommends protein-rich polypeptides. She says that they seem to work well even in people who react to dairy. I'm curious about obtaining that colostrum and have various things - chemical sensitivity/environmental illness, mercury toxicity, adrenal insufficiency... chronic fatigue... EMF sensitivity, autism-spectrum (Asperger's). I seem to have terrible, terrible reactions to milk products - raw, grass-fed milk included - after a rather nasty bout of poisoning from raw milk 8 months ago. Any relevant information as to whether or not I should try the colostrum? Other dairy has made my fears of people and aversion to them come back en force, given me uncomfortable, uncontrollable diarrhea, and a fever. My apologies if that was more medically graphic than you'd wanted, and any input would be much appreciated. Dairy has not seemed to agree with me since the food poisoning, and a Google search of "autism fever dairy" brings up a hit of autistic behavior in a child being triggered by dairy consumption. Low-carb for some months also seemed to have caused insulin hypersensitivity, or something similar to pre-diabetes. Though, perhaps that was caused or exacerbated by various toxic overloads as well. Oh - forgot to mention that I'm currently battle with some severe digestive problems. Along with the chemical sensitivity, this means that my immune system sensitizes to pretty much everything, and I have to rotate what foods I eat. If I eat the same foods too often - even things like game or grass-fed beef, I'll have intolerance reactions to them. With all of the copious amounts of research I've done, I highly suspect leaky gut/overall gut problems (microbiome? villi?). A test came back showing elevated candida albicans (which is quite common with mercury toxicity). Frequent-dose chelation will likely take 3-5 years until I'm well again, so I'm very much looking into what I can do to heal my gut in the meantime, despite the mercury causing rampant problems everywhere (many of which interfere with digestion). I suspect my current uncomfortable swings in mental clarity and mood stability are at least largely linked to gut health.